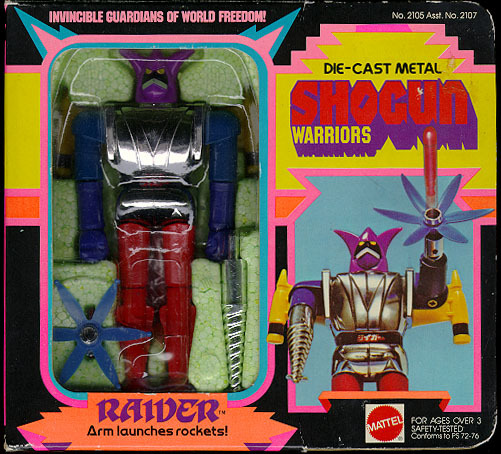 Shogun Warrior die-cast action figures were made mostly of metal with plastic extremities and accessories. These are re-packaged Popy chogokin from Japan, often with variations in color and accessories (especially in later released versions). 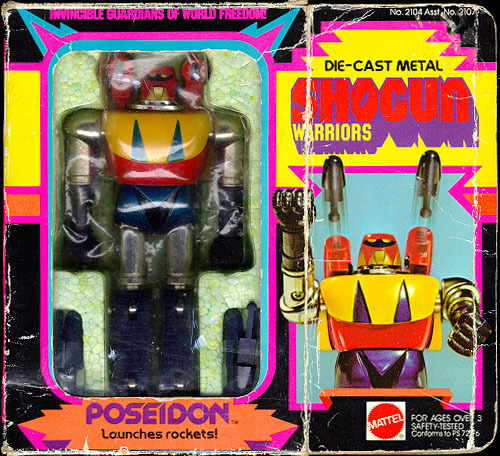 The packaging of Die-cast Shogun Warriors often indicates the release order. All the first release Shoguns that I have encountered have had green-tinted styrofoam inserts. 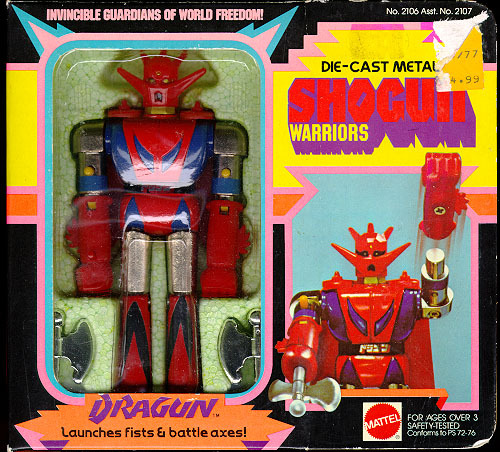 Usually, later versions are simplified and this is indicated on the packaging graphics (The first version Dragun box has the graphics with captions: "bend legs" "launch 3 axes & 2 fists" and "launch axe, then fist" while the 2nd version captions read "launch axe" "launch 2 axes & fist" and "launch fist"). Also, the first release boxes have a lighter pink outline and font color, while the later releases have hot pink (it's noticably darker). Other items of note: First issue boxes have a piece of cellophane glued into the box window while later boxes only have the clear plastic insert covers. I've found first issue boxes both with and without the clear plastic insert covers (I've come across an example of each "case fresh" so I believe they could come either way). Here's a comparison of 1st and 2nd release boxes (note the lightening bolts on Dragon's shins). 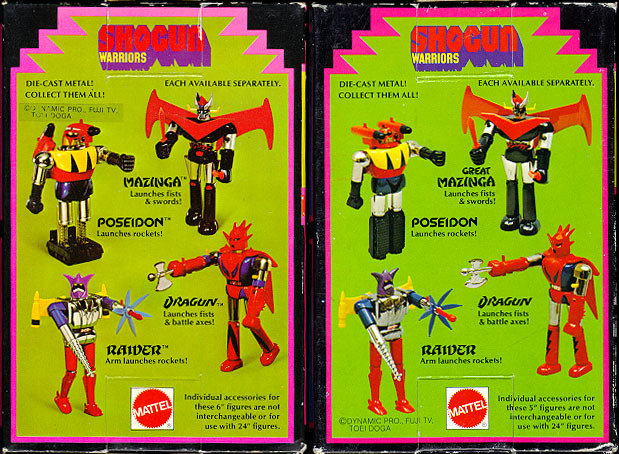 First issue boxes also had instruction sheets that applied to the version (1st issue directions show Poseidon with backward bending treads and retracting missile launchers...later version sheets show Poseidon without these features and Dragun is illustrated with lightening bolts on his legs instead of inverted "v"s (as a note, I've never found a Dragun die-cast with lightening bolt stickers). The Mattel warranty card on the first issue is of heavier, "manilla folder" colored stock, while the later issue warranty cards are cheap photocopy quality paper (printed). 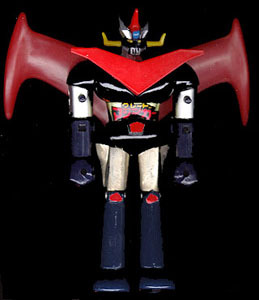 The first release (with the title "Mazinga") was the most highly detailed, featuring more articulated knees (later versions could hardly bend their knees! 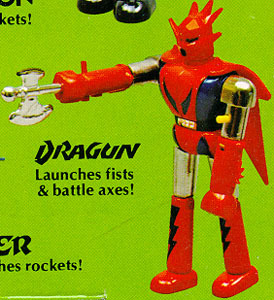 ), four shooting fists, four hard plastic red swords, and removable "rocket wings." 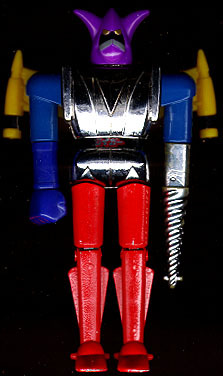 The first release features metallic red decals on the knees and belt (sometimes missing) and a 3 piece rocket wing...the rocket back and stabelizer are yellow with silver painted exhaust ports. The rib decal of all versions has GA-05 and Japan (the Popy designation) printed on the back. The box has a green styrofoam insert and a plastic window rather than the plastic formed cover of the later versions. All versions came with a Mattel warranty card and instruction sheet. 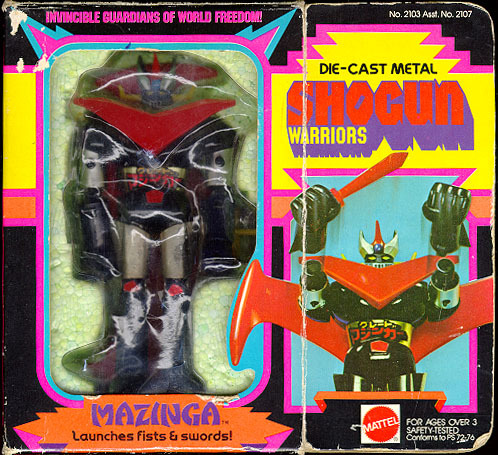 The box reads: "Die-cast Metal" Launches fists & swords!" "You can do these things! Detach rocket wings...Rotate arms...Bend legs...Launch 4 swords, 4 fists." 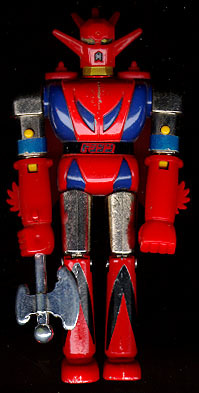 The second release had restricted knee articulation, no knee or belt decals, two soft vinyl orange-red swords and a simplified all red plastic rocket wing. Box graphics were changed to reflect the changes, as was the warranty card. 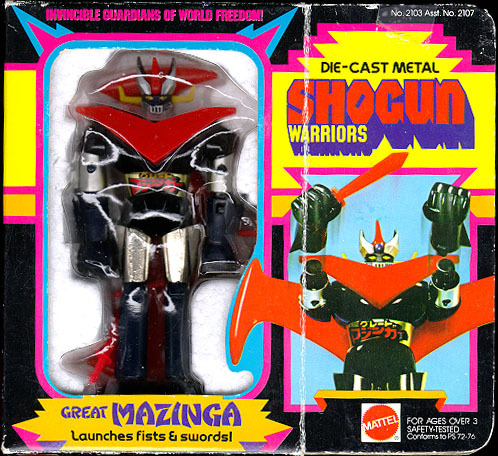 The box reads: "Die-cast Metal" Launches fists & swords!" "You can do these things! Detach rocket wings...Rotate arms...Launch fists...Launch 2 swords, 2 fists." The first release was the most interesting and desirable as it very closely worked like the actual Getter Robo Go Poseidon. The tread-like shins bend backwards to provide treads for locomotion (like a tank). The rocket launchers swing from the back (they are rockets for flying in this position) to the shoulders for over-the-shoulder firing. The first version has a chromed neck ring and a black "v" decal below the belt. He came with six black (may be navy colored) missiles and the package had a green insert (the box also has a clear plastic window glued to the box instead of a formed plastic cover for the insert). The box reads: "Die-cast Metal" Launches rockets!" "You can do these things! Aim rocket pods...Rotate arms...Feet become treads...Launch 6 rockets." The second release simplified the figure by locking the tread-like shins and rocket launchers. This release comes with four black (may be navy or possibly red) colored missiles and no below the belt decal. 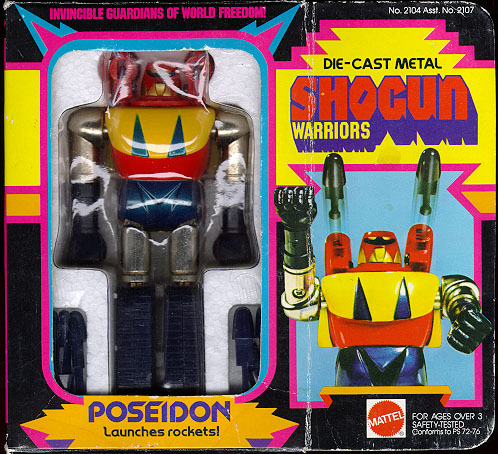 The box reads: "Die-cast Metal" Launches rockets!" "You can do these things! Rotate fists...Rotate arms...Aim rocket pods...Launch 4 rockets." 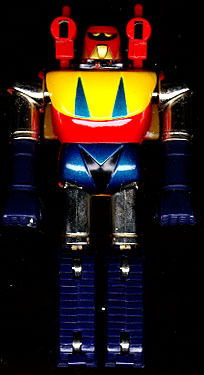 The third release comes with four yellow x-shaped "safety missiles" and has the "v" below the belt painted red. Otherwise the figure is the same. The box has a round white sticker with "Redesigned Rockets Inside/Rockets Shown Not Included" applied. The first release was the most highly detailed, featuring articulated knees (later versions could not bend their knees! 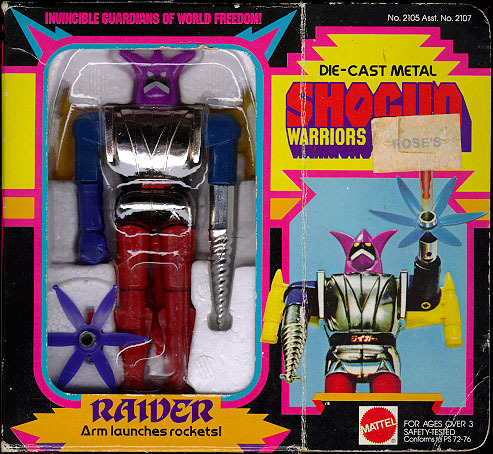 ), two removable fists, drill hand, and spinning star which launches one of six red rockets. The first release has black bands around the bottoms of the rocket-wing rockets. The box has a green styrofoam insert and both a plastic window and the plastic formed cover of the later versions. The second release comes with only four missiles and cannot bend their knees. The figure does not come with a left hand, rather the drill had is mounted to the left arm in the package. There are no black bands around the rockets. Otherwise the figure is the same. The first release was the most highly detailed, featuring articulated knees, blue bands above the fists (which both shoot off! ), a gold painted neck and inverted "v" decals on the chins. The right shooting fist could also fire one of the three axes included with the figure. The first release came in a windowed box with a green styrofoam insert. The box reads: "Die-cast Metal" Launches fists & battle axes!" "You can do these things! Rotate Arms...Launch 3 axes & 2 fists...Bend legs...Launch axe, then fist." The second release simplified the figure by locking the right fist (it would not fire off). The neck is an unpainted red and there are no blue decals on the upper arms. This release has a white styrofoam insert and comes with only two axes. The box reads: "Die-cast Metal" Launch fist & battle axes!" "You can do these things! Rotate Arms...Launch 2 axes & fist...Launch axe...Launch fist." The third release is reported but not verified. It has chrome lightening bolts on the shins and may feature non-firing axes (the axes push out when the button is depressed but does not fire). 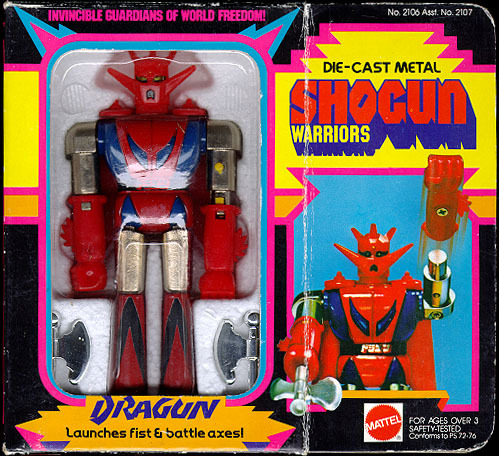 I was told about this version some time back but in my many years of collecting, have never seen it (possibly a Shogun Urban Myth! ).